The German secret services had been warned in February of this year already about the radicalization of Mr. Jawed S. the Afghan youngster who stabbed 2 American tourists in Amsterdam’s Central Station last Friday. An employee of the youth institution where he resided in Germany signaled a worrying change in his behavior in February of this year already and informed authorities. The German Ministry of the Interior declared in the meantime that Mr. Jawed S.’s asylum demand had initially been rejected but that his appeal was still pending. The Dutch police receive help from investigative services in the German Rhineland-Palatinate province. There is currently no criminal investigation in Germany against the 19-year-old. Jawed S. says he has committed the attack because he thinks Islam was being insulted in the Netherlands. During his interrogation, the Afghan named PVV leader Mr Geert Wilders among others as one of the reasons for committing the stabbing attack which injured two American tourists visiting the Dutch capital. The Dutch Public Prosecution Service admitted that the Afghan asylum seeker had a 'clear terrorist motive' and had come to Amsterdam specifically to commit an attack. “He believes that in the Netherlands 'the Prophet Muhammad, the Koran, Islam, and Allah are frequently offended,” according to the Public Prosecution Service. The 19-year-old Jawed S. mentioned Wilders during that interrogation. However, he did not say anything about the recently organized cartoon contest about the prophet Muhammad. A great commotion had arisen about this competition, including in Afghanistan, Indonesia, and Pakistan. According to the Public Prosecutor, there is still no indication that the Afghan would have cooperated with others when he stabbed the two American travelers. The young refugee remains in hospital where he is being treated for his injuries. He was shot by the police after the stabbing. 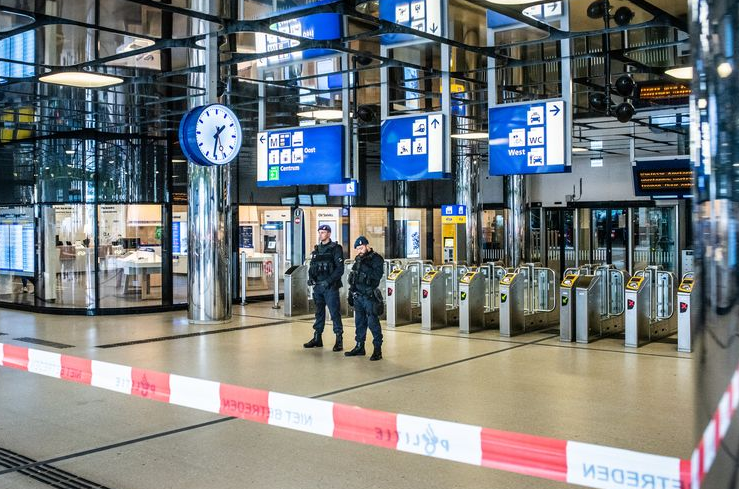 The investigation showed so far that Jawed S., who has a German residence permit, arrived on Friday morning with an international train at Amsterdam Central Station. A little after noon, three-quarters of an hour after his arrival with the ICE, he approached the two men at the station. The Afghan told the police that he randomly chose his victims. He did not know that the two 38-year-old victims were American tourists. They were visiting the Netherlands. Police Commissioner Aalbersberg claims that thanks to the presence of police officers at the station, young Jawed S. was unable to claim more victims. “Between the first stabs and the arrest of Jawed S. were only 9 seconds. The agents made the difference. Otherwise, there would have been more casualties." According to the police chief, Jawed S. was out to make many victims at the station. European Union has OPEN BORDERS. Like has been said as 1/2 joke 1/2 serious. Heaven has strict immigration rules. Hell accepts anyone without question. Open Borders is pretty much a Hellish operation..